In contrast to endogenous opioids, the highly addictive drug morphine activates the μ-opioid receptor without causing its rapid endocytosis. It has recently been reported that coapplication of low concentrations of [d-Ala2,N-Me-Phe4,Gly5-ol]-enkephalin (DAMGO) facilitates the ability of morphine to stimulate μ-opioid receptor endocytosis and prevents the development of morphine tolerance in rats. To investigate the clinical relevance of this finding for analgesic therapy, the endocytotic efficacies of a series of clinically used opioids were determined, and the effect of a combination of these drugs with morphine on the μ-opioid receptor endocytosis in receptor-expressing human embryonic kidney (HEK) 293 cells was quantified. 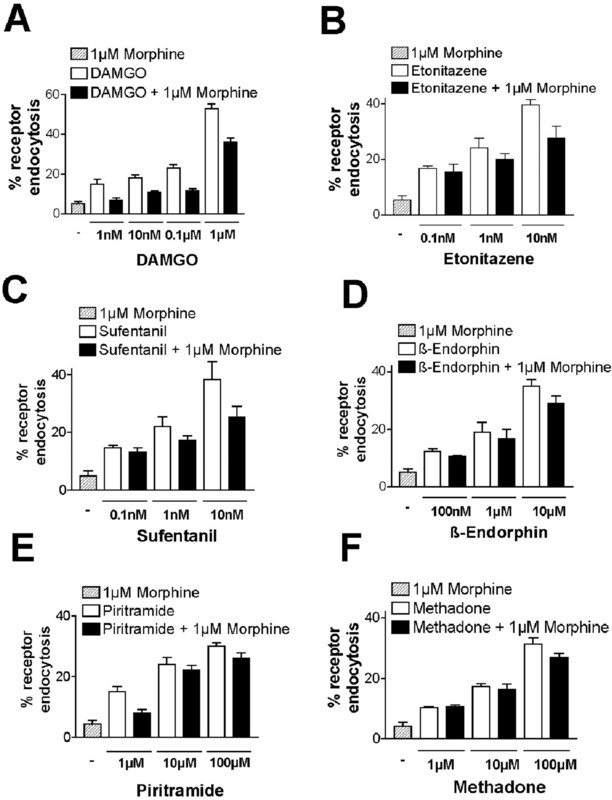 The combination of morphine and opioid drugs with high endocytotic efficacies (e.g., DAMGO, etonitazene, sufentanil, β-endorphin, piritramide, or methadone) did not result in a facilitation of morphine-mediated endocytosis but rather in a decrease of the receptor endocytosis mediated by the tested opioid drugs. These findings demonstrate a partial agonistic effect of morphine on the agonist-induced receptor endocytosis. Moreover, we demonstrated that the endocytotic potencies of opioid drugs are negatively correlated with their ability to cause receptor desensitization and opioid tolerance in HEK 293 cells. These results strongly support the hypothesis that μ-opioid receptor endocytosis counteracts receptor desensitization and opioid tolerance by inducing fast receptor reactivation and recycling. In addition, it is shown that agonist-induced receptor endocytosis facilitates the compensatory up-regulation of the cAMP pathway, a cellular hallmark of opioid withdrawal. Our findings suggest that opioids with high endocytotic efficacies might cause reduced opioid tolerance but can facilitate compensatory mechanisms, resulting in an enhanced opioid dependence. In vitro and in vivo studies revealed that on the cellular level, long-term opioid treatment leads to a rapid receptor desensitization with reduction of agonist response followed by internalization of receptors. An important mechanism of μ-opioid receptor (MOR) desensitization is the phosphorylation of intracellular receptor domains by G protein-coupled receptor kinases or second messenger-regulated protein kinases, such as Ca2+/calmodulin-dependent protein kinase II (Koch et al., 1997, 2000; Pak et al., 1997; Wolf et al., 1999). After phosphorylation of Ser/Thr residues on the C terminus of the receptor, arrestins are frequently recruited to the plasma membrane, where they accelerate uncoupling of the receptor from the G protein and facilitate receptor endocytosis by serving as scaffolding proteins that bind to clathrin (Ferguson et al., 1996; Goodman et al., 1996). Internalized receptors can be sorted either to a degradative pathway or recycling pathway returning active receptors to the plasma membrane (von Zastrow et al., 2003). Thus, the regulation of μ-opioid receptor endocytosis and trafficking might play a critical role in the development of opioid tolerance and dependence. Whereas endogenous opioids as well as the synthetic peptide DAMGO promote the rapid endocytosis of μ-opioid receptors, the highly addictive drug morphine fails to promote detectable endocytosis, even when present at high concentrations. It has recently been reported that the coapplication of a low concentration of the μ-agonist DAMGO can facilitate the morphine-induced μ-opioid receptor endocytosis and results in a loss of morphine tolerance development in rats (He et al., 2002). This intriguing finding might have implications for the analgesic therapy, because coapplication of morphine with a receptor-internalizing opioid agonist should induce less opioid tolerance than morphine alone. Therefore, in the present study, we investigated the effect of a coapplication of low doses of receptor-internalizing and clinically relevant opioids on the morphine-induced μ-opioid receptor endocytosis. It has been demonstrated in numerous studies that agonist-induced μ-opioid receptor endocytosis can reduce the development of opioid tolerance (Koch et al., 1998, 2001, 2004; Whistler et al., 1999; He et al., 2002), but the mechanisms that are responsible for the protection against opioid tolerance by receptor endocytosis are still controversially discussed. One hypothesis is that μ-opioid receptor endocytosis leads to a rapid down-regulation of receptor signaling (Whistler et al., 1999). For example, agonists that do not induce endocytosis such as morphine were predicted to have a longer duration of action, leading to greater compensatory effects [e.g., adenylate cyclase (AC) superactivation] and thus greater tolerance and addiction (Whistler et al., 1999). Agonists that drive receptor endocytosis should lead to a fast receptor uncoupling from the G protein and therefore a lesser extent of compensatory effects and tolerance (Whistler et al., 1999; He et al., 2002); however, recent studies have demonstrated that endocytosed μ-opioid receptors are predominantly and rapidly recycled to the cell surface in a reactivated state (Ferguson et al., 1998; Koch et al., 1998, 2001; El Kouhen et al., 1999; Law et al., 2000). These findings led to a revision of the prevailing hypothesis and suggest that μ-opioid receptor endocytosis is an important mechanism in ensuring that desensitized and internalized receptors are rapidly recycled to the cell surface in an active form, maintaining receptor signaling and reducing receptor desensitization and tolerance development (Koch et al., 1998, 2001; Finn and Whistler, 2001). In this revised model, noninternalizing agonists such as morphine cause an accumulation of desensitized receptors in the plasma membrane, resulting in greater opioid tolerance (Koch et al., 2001, 2004; Schulz et al., 2004). To further elucidate the role of endocytosis in the regulation of receptor signaling, we analyzed the effect of μ-opioid receptor endocytosis by a large series of predominantly used opioids on the receptor desensitization rate. We found that the endocytotic efficacy of opioids is negatively correlated with the development of receptor desensitization. This finding is further supported by our observation that receptor endocytosis enhances the compensatory up-regulation of adenylate cyclase activity by reducing receptor desensitization and maintaining the receptor signaling. These results strongly indicate that receptor endocytosis followed by receptor recycling counteracts the development of opioid tolerance by a fast receptor reactivation. Drugs. Morphine was obtained from Synopharm (Barsbüttel, Germany), β-endorphin and DAMGO were obtained from Bachem (Heidelberg, Germany), and methadone was obtained from Merck Biosciences (Darmstadt, Germany). Pethidine was purchased from Aventis (Bad Soden, Germany), and etonitazene was purchased from Novartis (Nürnberg, Germany). Hydromorphone was provided by Knoll GmbH (Uetersen, Germany), oxycodone was provided by Mundipharma (Limburg/Lahn, Germany), nortilidine was provided by Pfizer (Karlsruhe, Germany), buprenorphine was provided by Grünenthal GmbH (Aachen, Germany), and piritramide, sufentanil, and fentanyl were provided by Janssen-Cilag (Neuss, Germany). All other reagents were of analytical grade from standard commercial sources. Epitope Tagging and Cloning of cDNA. The rat μ-opioid receptor (MOR1) was tagged at the NH2 terminus with the HA epitope tag sequence MYPYNVPNYA using polymerase chain reaction and then subcloned into the pEAK10 expression vector (Edge BioSystems, Gaithersburg, MD). Generation of Cell Lines Expressing μ-Opioid Receptors. Transfection of human embryonic kidney (HEK) 293 cells was performed by the calcium phosphate precipitation method (Chen and Okayama, 1988). Approximately 1.5 × 106 cells were transfected with 20 μg of plasmid DNA. Cells were selected in the presence of 1 μg/ml puromycin (Sigma-Aldrich, Deisenhofen, Germany), and resistant cells were grown in the presence of 1 μg/ml puromycin. Six clones were generated, and receptor expression was monitored using saturation ligand binding assays. Radioligand Binding Assays. Binding studies were performed on membranes prepared from stably transfected cells. The dissociation constant (KD) and number of [3H]DAMGO binding sites (Bmax) was calculated by Scatchard analysis using at least six concentrations of [3H]DAMGO in a range from 0.3 to 9 nM, as described previously (Koch et al., 1998). Nonspecific binding was determined as radioactivity bound in the presence of 1 μM unlabeled DAMGO. Quantitative Internalization Assay. Cells were seeded at a density of 2 × 105 per well and grown onto poly-l-lysine-treated 24-well plates overnight. After washing, cells were preincubated with 1 μg of affinity-purified rabbit anti-HA antibody for 2 h in OptiMEM 1 (Invitrogen, Carlsbad, CA) at 4°C. For induction of receptor internalization, cells were then treated as indicated with various doses of agonists for 60 min in OptiMEM at 37°C. After fixation with 4% paraformaldehyde and 0.2% picric acid in 0.1 M phosphate buffer and washing in Tris-phosphate-buffered saline (10 mM Tris, 10 mM phosphate buffer, 137 mM NaCl, and 0.05% thimerosal, pH 7.4), cells were incubated with peroxidase-conjugated anti-rabbit antibody (1:1000; Amersham Biosciences Europe GmbH, Freiburg, Germany) for 2 h at room temperature. Plates were developed with 250 μl of ABTS solution (Roche Molecular Biomedicals, Mannheim, Germany) at room temperature. After 10 to 30 min, 200 μl of the substrate solution from each well was transferred to a 96-well plate and analyzed at 405 nm using a microplate reader. Determination of Receptor Signaling, Desensitization, and cAMP Superactivation by Measurement of cAMP Accumulation. Approximately 1.5 × 105 cells per well were seeded in 22-mm 12-well dishes with Dulbecco's modified Eagle's Nut F-12 medium containing 10% fetal calf serum and incubated at 37°C for 24 h. For desensitization measurements, HEK 293 cells expressing MOR1 were either exposed or not for 1 h with receptor-saturating opioid doses, followed by determination of agonist-induced inhibition of forskolin-stimulated adenylate cyclase. Treatment with 25 μM forskolin (BIOTREND Chemikalien GmbH, Köln, Germany) resulted in a 5-fold increase of intracellular cAMP compared with untreated MOR1-expressing HEK 293 cells. Maximum agonist-induced inhibition of cAMP accumulation without agonist preincubation has been defined as 100%. Receptor desensitization was measured as the decreased ability of the agonist to inhibit forskolin-stimulated adenylate cyclase activity after 1 h of agonist treatment. For the cAMP superactivation measurements, MOR1-expressing HEK 293 cells were underwent long-term exposure to 1 μM DAMGO or 1 μM morphine for 1 and 8 h. For agonist withdrawal, the cells were rinsed three times in drug-free medium, followed by measurement of cAMP accumulation. For the measurement of cAMP accumulation, medium was removed from individual wells and replaced by 0.5 ml of serum-free RPMI medium (Seromed, Berlin, Germany) containing 25 μM forskolin or 25 μM forskolin plus receptor-saturating doses of agonists. The cells were incubated at 37°C for 15 min. The reaction was terminated by removing the medium and sonicating the cells in 1 ml of ice-cold HCl/ethanol (1 volume of 1 N HCl/100 volumes of ethanol). After centrifugation, the supernatant was evaporated, the residue was dissolved in triethylamine buffer, and the cAMP content was determined using a commercially available radioimmunoassay kit (Amersham Biosciences Europe GmbH). Statistical evaluation of results was carried out using ANOVA followed by Bonferroni test. Expression of HA Epitope-Tagged μ-Opioid Receptor in HEK 293 Cells. The rat μ-opioid receptor MOR1 was HA epitope-tagged, subcloned in the pEAK10 expression vector (Edge BioSystems), and stably expressed in HEK 293 cells. From six stably transfected clones, we selected a cell line that expressed 968 ± 7 fmol of [3H]DAMGO binding sites per milligram of membrane protein. The KD for [3H]DAMGO was 1.55 ± 0.4 nM. 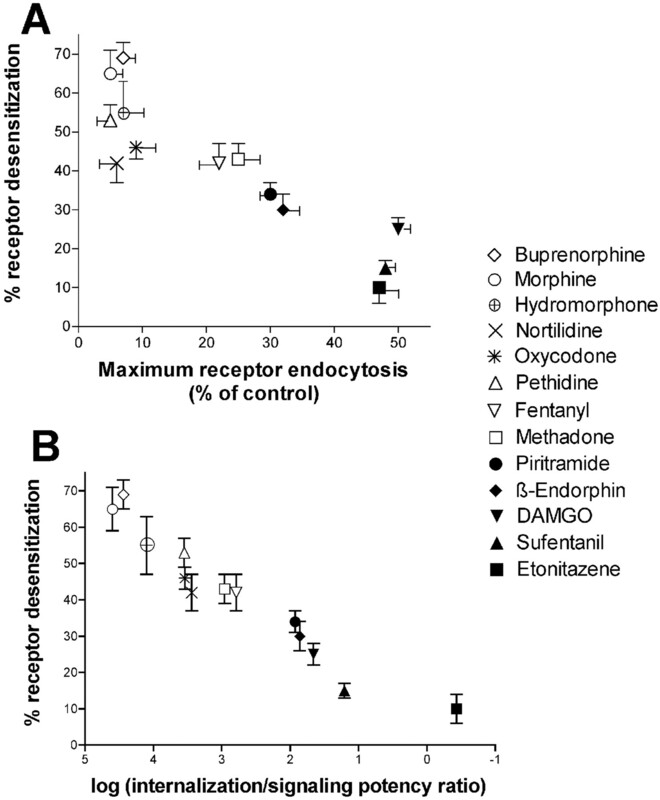 Determination of Opioid Efficacies and Potencies for Receptor Internalization. To determine the efficacies and potencies of various opioids to induce μ-opioid receptor endocytosis in HEK 293 cells, we used an ELISA technique to quantify the maximum agonist-induced internalization of HA epitope-tagged MORs in intact HEK 293 cells (Koch et al., 2004). A maximal (50%) receptor internalization was found after 60 min of agonist treatment, even with low concentrations of DAMGO (1 μM), etonitazene (10 nM), and sufentanil (10 nM) (Table 1; Fig. 1). Consistent with quantitative internalization experiments reported previously (Keith et al., 1998), the agonists β-endorphin, piritramide, methadone, and fentanyl caused partial internalization (20–30%), but only when present at high concentrations (≥10 μM). Under the same conditions, morphine, nortilidine, pethidine, buprenorphine, hydromorphone, and oxycodone failed to induce significant μ-opioid receptor endocytosis, even when present at high concentrations (Table 1; Fig. 1). 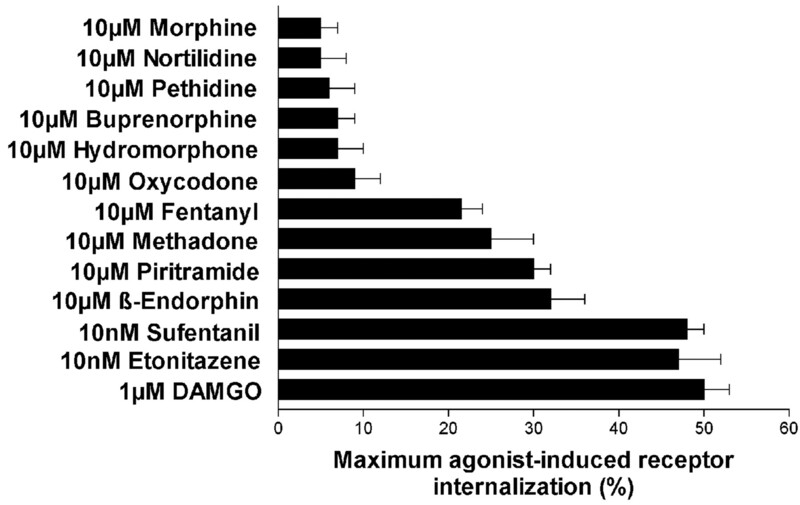 Thus, the drugs differ in their percentage of maximal receptor internalization with the following rank order: DAMGO = sufentanil = etonitazene >> β-endorphin = piritramide > methadone = fentanyl >>> > oxycodone > hydromorphone = buprenorphine = nortilidine = pethidine = morphine. However, analyses of the dose dependence of receptor endocytosis of the various agonists revealed that sufentanil and etonitazene were ≈600-fold more potent than DAMGO in promoting receptor endocytosis (EC50 endocytosis, Table 1). On the other hand, DAMGO was ≈16-fold more potent than methadone and ≈130-fold more potent than fentanyl in inducing half-maximal receptor endocytosis (Table 1). Morphine, pethidine, nortilidine, buprenorphine, hydromorphone, and oxycodone were incapable of inducing detectable receptor endocytosis, even at very high concentrations (>100 μM). Thus, according to Keith et al. (1998), the EC50 for endocytosis for the noninternalizing drugs was defined to be greater than 1 mM (Table 1). Potency for opioid agonist stimulation of adenylate cyclase inhibition, induction of internalization, and receptor desensitization in MOR1-expressing HEK293 cells For EC50 calculation, μ-opioid receptor-expressing HEK293 cells were incubated with increasing amounts of agonists (10-13-10-4 M), and adenylate cyclase inhibition and internalization data were analyzed (sigmoidal dose-response curve fit analysis; GraphPad Software Inc., San Diego, CA). RAVE was defined as relative activity versus endocytosis. Similar to Whistler et al. (1999), the peptide DAMGO was defined as having activity and endocytosis of 1 and thus a RAVE of 1. Based on the DAMGO values, morphine has a relative activity of 0.98 and relative endocytosis of 0.1, resulting in a RAVE of 9.8. Quantitative analysis of agonist-induced MOR1 internalization by ELISA. MOR1-expressing HEK 293 cells were treated with the drugs shown for 60 min. The agonist concentrations represent the doses required to induce the maximal effect on receptor endocytosis for each drug. After drug treatment, ELISA quantified the receptor endocytosis as described under Materials and Methods. Values are the mean of ± standard error of three to six separate experiments. Effect of Coapplication of Various Receptor-Internalizing Opioids on the Morphine-Induced μ-Opioid Receptor Endocytosis in HEK 293 Cells. In the next step, we tested three opioids with high endocytotic efficacies (e.g., DAMGO, etonitazene, and sufentanil) (Fig. 2, A–C) as well as three agonists with lower endocytotic efficacies (e.g., β-endorphin, piritramide, and methadone) (Fig. 2, D–F) with regard to their effects on the morphine-induced receptor endocytosis. Therefore, ascending opioid concentrations of the drugs mentioned above resulting in increasing receptor endocytosis were used in combination with 1 μM morphine (Fig. 2). However, neither low nor high concentrations of the tested receptor-internalizing agonists led to an enhanced morphine-induced receptor endocytosis compared with the tested agonists alone (Fig. 2). In contrast, for all concentrations, the agonist-induced endocytosis in the presence of 1 μM morphine was less than that induced by the tested agonist concentrations alone. In addition, coapplication of higher concentrations (5 and 30 μM) of morphine dose-dependently reduced the agonist-induced endocytosis of the tested agonists (data not shown). In fact, coapplication of morphine led to a decrease of the receptor internalization rate for all tested agonists, demonstrating that morphine clearly behaves as a partial agonist for inducing receptor endocytosis (Fig. 2). Effect of various μ-opioid agonists on morphine-induced μ-opioid receptor internalization. Coapplication of morphine with indicated concentrations of DAMGO (A), etonitazene (B), sufentanil (C), β-endorphin (D), piritramide (E), or methadone (F) did not enhance the μ-opioid receptor endocytosis compared with that induced by the tested agonists alone. Note that, in fact, coapplication of morphine reduced the μ-opioid receptor endocytosis induced by all doses of agonists tested. Values are the mean of ± standard error of three separate experiments. Determination of Relative Activity versus Endocytosis Values and Internalization/Signaling Potency Ratios for Various Opioids. By using the maximum percentage of receptor endocytosis and adenylate cyclase (AC) inhibition, we next calculated the relative activity versus endocytosis (RAVE) values of the tested agonists (Table 1). According to the RAVE model (Whistler et al., 1999), DAMGO was defined as having activity and endocytosis of 1 and thus a RAVE of 1. As expected, and consistent with the RAVE model, similarly low RAVE values between 1 and 1.76 were calculated for agonists promoting high or partial receptor endocytosis, whereas the noninternalizing agonists revealed high RAVE values between 5 and 9.8 (Table 1). To further investigate whether the agonist potency for induction of receptor signaling is correlated with the ability to induce receptor endocytosis, the concentrations of various opioids required to achieve 50% of maximal response (EC50) for both inhibition of cAMP accumulation and receptor endocytosis were calculated. The tested agonists exhibited inhibition of cAMP accumulation with maximal effects or efficacies ranging from 31% to 72% (Table 1). The EC50 values for adenylate cyclase inhibition of all ligands studied were between 0.055 to 370 nM. When the internalization/signaling potency ratios of the EC50 values for internalization and adenylate cyclase inhibition were compared, the lowest ratios were found for the highly potent drugs etonitazene and sufentanil (0.37 and 16.4, respectively), followed by DAMGO, β-endorphin, and piritramide, with ratios of 46, 73, and 86, respectively (Table 1). The agonists fentanyl and methadone, promoting only partial receptor internalization, revealed ratios of 620 and 909, respectively. Highest ratios (≈ 3000–40,000) were found for the noninternalizing drugs nortilidine, oxycodone, pethidine, morphine, buprenorphine, and hydromorphone. The observed great differences in the internalization/signaling potency ratios between the drugs tested indicate that the relative potency of individual agonists for promoting receptor internalization is not correlated with signaling potency and thus is an independent functional property of opioid agonists. Role of μ-Opioid Receptor Endocytosis in the Agonist-Induced Receptor Desensitization. Next we investigated whether the observed differences of the opioids in promoting receptor internalization would affect the rate of agonist-induced desensitization. Receptor desensitization was measured as the decreased ability of the agonist to inhibit forskolin-stimulated adenylate cyclase activity after extended agonist pretreatment. We have demonstrated in previous studies that 1 h of agonist pretreatment is sufficient to induce marked receptor desensitization in HEK 293 cells expressing the μ-opioid receptor (Koch et al., 1998, 2004). Thus, in the present study, HEK 293 cells expressing MOR1 were pretreated for 1 h with receptor-saturating opioid doses, followed by determination of agonist-induced inhibition of forskolin-stimulated adenylate cyclase. Forskolin treatment resulted in a 5-fold increase of intracellular cAMP (up to 4 pmol) compared with untreated MOR1-expressing HEK 293 cells. Maximum agonist-induced inhibition of cAMP accumulation without agonist preincubation has been defined as 100%. As depicted in Fig. 3A, prolonged exposure (1 h) to noninternalizing agonists (e.g., buprenorphine, morphine, hydromorphone, pethidine, nortilidine, and oxycodone) resulted in strong (≈40–70%) receptor desensitization. Opioids that promote partial receptor endocytosis (e.g., fentanyl, methadone, piritramide, and β-endorphin) revealed only ≈30 to 40% of receptor desensitization, and remarkably, weakest receptor desensitization (≈10–25%) was observed for the opioids inducing high receptor endocytosis (e.g., DAMGO, sufentanil, and etonitazene) (Fig. 3A). By using the nonparametric Spearman's test, a significant negative correlation between receptor endocytosis and desensitization was found (Fig. 3A). To further evaluate the correlation of signaling and internalization potencies and receptor desensitization, we calculated the internalization/signaling potency ratios of the agonists (Table 1). In the HEK 293 cell expression system, we detected an almost linear and highly significant correlation between the internalization/signaling potency ratios of the tested opioids and the induced μ-opioid receptor desensitization (Fig. 3B). These results can be explained by the model that agonist-induced receptor endocytosis maintains receptor signaling during long-term agonist treatment by fast receptor recycling and reactivation. Thus, we predicted that blocking of receptor recycling and reactivation by monensin would accelerate agonist-induced receptor desensitization. As expected, coapplication of monensin with the receptor-internalizing agonists DAMGO and methadone resulted in an enhanced receptor desensitization after 1 h of agonist treatment (Fig. 4). On the other hand, monensin treatment had no effect on the desensitization of the morphine-treated receptor, which does not undergo endocytosis (Fig. 4). Furthermore, in control experiments, monensin treatment had no effect on the adenylate cyclase activity and the functional coupling of the μ-opioid receptor (data not shown). Note that in the presence of recycling blocker monensin, the three tested agonists revealed similar receptor desensitization after 1 h of agonist treatment. This strongly supports the idea that differences in the agonist-induced receptor desensitization might be caused by differences in the ability of agonists to mediate receptor endocytosis and recycling. A, comparison of MOR1 endocytosis and desensitization in HEK 293 cells. For the desensitization experiments, MOR1-expressing HEK 293 cells were preincubated for 60 min with indicated drugs; each drug concentration was 100 times its EC50 for AC inhibition (Table 1). After washing, cells were treated with 25 μM forskolin or 25 μM forskolin plus the respective agonist, and cAMP levels were determined as described under Materials and Methods. Maximum agonist-induced inhibition of cAMP accumulation without agonist preincubation has been defined as 100%. The resulting receptor desensitization data were compared with the data summarized from all endocytosis experiments (Fig. 1). Values are the mean ± standard error of three to six separate experiments. The percentage of the total MOR internalized by a given concentration of agonist (taken from Fig. 1) was plotted as a function of amount of desensitization. A significant negative correlation was found (nonparametric Spearman's test; r = -0.8595; two-tailed, p = 0.0002). B, comparison of the internalization/signaling EC50 ratio of opioid agonists and the receptor desensitization in HEK 293 cells. The receptor desensitization data after 1 h of agonist treatment (Table 1) were compared with the internalization/signaling EC50 ratios (Table 1) of the tested agonists. A significant correlation was found (nonparametric Spearman's test; r = 0.9739; two-tailed, p < 0.0001). Effect of monensin treatment on the agonist-induced μ-opioid receptor desensitization. For the desensitization experiments, MOR1-expressing HEK 293 cells were preincubated for 60 min with indicated agonists with and without 50 μM monensin; each agonist concentration was 100 times its EC50 for AC inhibition (Table 1). After washing, cells were treated with 25 μM forskolin or 25 μM forskolin plus the respective agonist, and cAMP levels were determined as described under Materials and Methods. Maximum agonist-induced inhibition of cAMP accumulation without agonist preincubation has been defined as 100%. Values are the mean ± standard error of three to six separate experiments. *, significant difference in agonist-induced receptor desensitization between monensin-treated and -untreated cells (ANOVA followed by Bonferroni's test; p < 0.05). Note that for the receptor-internalizing drugs DAMGO and methadone, treatment with the recycling blocker monensin resulted in a distinct increase of receptor desensitization. In contrast, receptor desensitization after morphine treatment was not affected by the coapplication of monensin. Role of Receptor Endocytosis in the Compensatory Up-Regulation of the cAMP Pathway after Prolonged Agonist Treatment. The finding that agonists with high efficacies in inducing receptor endocytosis revealed only weak receptor desensitization led us to propose that prolonged signaling caused by receptor endocytosis and recycling should facilitate the compensatory development of adenylate cyclase superactivation. Therefore, the effect of incubation with DAMGO and morphine for 1 and 8 h on the cAMP accumulation in HEK 293 cells was examined. Pretreatment for 1 h with DAMGO or morphine did not result in a detectable cAMP superactivation (Fig. 5A). However, treatment with morphine for 8 h resulted in a ∼4-fold cAMP superactivation, whereas 8 h-treatment with the receptor-internalizing agonist DAMGO resulted in a ∼5 to 6-fold cAMP superactivation (Fig. 5A). Because both agonists showed similar signaling efficacies and potencies (Table 1), we speculated that the observed variations in the cAMP accumulation after long-term agonist treatment might be affected by differences in the efficacies of DAMGO and morphine to induce receptor endocytosis and recycling. To further analyze the role of receptor endocytosis and recycling in the process of cAMP accumulation, MOR1-expressing cells were treated with DAMGO in the presence or absence of the recycling blocker monensin for 8 h. Figure 5B shows that, in the presence of the recycling blocker monensin, the DAMGO-induced cAMP accumulation was significantly decreased compared with cells treated with DAMGO alone. Moreover, the morphine-induced cAMP accumulation was not affected by the coapplication of monensin (Fig. 5B). A splice variant of the mouse μ-opioid receptor (MOR1D) has recently been identified that undergoes receptor endocytosis and recycling after morphine treatment (Pan et al., 1999; Koch et al., 2001). We therefore tested whether MOR1 and MOR1D differ in the cAMP accumulation after morphine treatment. As depicted in Fig. 5C, the internalizing receptor splice variant MOR1D revealed a higher cAMP accumulation after 8 h of morphine treatment compared with MOR1, which is not internalized by morphine treatment. These results strongly confirm our hypothesis of receptor signaling maintenance by receptor endocytosis and recycling resulting in an up-regulation of the cAMP pathway during long-term agonist treatment. Effect of receptor internalization on the superactivation of cAMP pathway in HEK 293 cells. A, MOR1-expressing cells underwent long-term treatment (1 and 8 h) with 1 μM DAMGO or 1 μM morphine, and superactivation of the cAMP pathway after agonist withdrawal was assessed relative to untreated control cells. Significant up-regulation of the cAMP pathway was detected after 8 h of agonist treatment but not after 1 h; however, 8 h of DAMGO treatment resulted in a higher cAMP up-regulation compared with morphine-treated cells. *, significant difference in cAMP superactivation between morphine- and DAMGO-treated cells (ANOVA followed by Bonferroni's test; p < 0.01). B, cells treated for 8 h with DAMGO or morphine in the presence or absence of 50 μM monensin. After DAMGO withdrawal, the monensin-pretreated cells revealed a significantly lower cAMP up-regulation compared with cells only treated with DAMGO; however, monensin treatment had no effect on the morphine-induced cAMP up-regulation. *, significant difference in cAMP superactivation between monensin-treated and -untreated cells after 8 h of DAMGO incubation (ANOVA followed by Bonferroni's test; p < 0.05). C, MOR1- and MOR1D-expressing HEK 293 cells treated with 1 μM morphine for 8 h. Saturation binding experiments revealed no marked differences between MOR1D- and MOR1-expressing cells with respect to their number of [3H]DAMGO binding sites (Bmax) (847 ± 8 fmol/mg protein and 968 ± 7 fmol/mg protein for MOR1D and MOR1, respectively). Note that after agonist withdrawal, MOR1D-expressing cells revealed a significantly higher cAMP up-regulation than rMOR1-expressing cells. *, significant difference in cAMP superactivation between MOR1- and MOR1D-expressing cells after 8 h of morphine treatment (ANOVA followed by Bonferroni's test; p < 0.01,). Long-term opioid treatment results in the development of tolerance that reduces the responsiveness to the agonist. The mechanisms involved in the development and regulation of opioid tolerance are multifaceted. After long-term opioid treatment, the μ-opioid receptor undergoes fast receptor phosphorylation and uncoupling, followed by receptor internalization. Both the μ-opioid receptor desensitization and subsequent receptor internalization have long been considered to directly contribute to the development of opioid tolerance by reducing the number of signaling receptors. In contrast to this hypothesis, recent studies have demonstrated that agonist-induced μ-opioid receptor internalization plays an important role in reducing the development of opioid tolerance after long-term agonist treatment (Koch et al., 1998, 2001; Whistler et al., 1999; Finn and Whistler, 2001; Williams et al., 2001). Remarkably, it has recently been reported that the coapplication of a low dose of the receptor-internalizing drug DAMGO can facilitate the morphine-induced endocytosis of oligomeric μ-opioid receptor complexes and thus prevent morphine tolerance in rats (He et al., 2002). This finding prompted us to investigate whether a combination of morphine with clinically important receptor-internalizing opioids might be relevant for analgesic therapy in reducing morphine tolerance. We therefore determined the endocytotic efficacies and potencies of a series of clinically relevant opioids and tested the effect of a coapplication of these agonists on morphine-induced receptor internalization. To further investigate the effect of endogenously expressed opioids on the morphine-induced internalization, we included β-endorphin in our test. When various concentrations of the receptor-internalizing agonists etonitazene, sufentanil, β-endorphin, piritramide, or methadone were coapplied with morphine, we observed an increase in receptor endocytosis compared with morphine alone, but this effect was less than that induced by the tested receptor-internalizing agonists alone. Indeed, in our coapplication test, morphine acted as a partial agonist and inhibited the receptor endocytosis induced by all tested agonists. Moreover, we and others (Bailey et al., 2003) failed to detect a facilitating effect of DAMGO on the morphine-induced receptor endocytosis in HEK 293 cells, as published by He et al. (2002). Thus, the mechanistic basis for the reduction of morphine-induced tolerance in rats by coapplication of a low dose of DAMGO remains unknown. In addition, it is still unresolved by which mechanism receptor endocytosis reduces the development of opioid tolerance. The RAVE model suggests that receptor endocytosis results in a fast uncoupling and termination of receptor-signaling reducing cellular adaptive changes that add to the development of opioid tolerance (Whistler and von Zastrow, 1999). However, recent publications demonstrated that μ-opioid receptors undergo fast receptor recycling and reactivation after endocytosis (Koch et al., 1998, 2001; Law et al., 2000; Ferguson, 2001) and that receptor uncoupling and internalization as well as opioid tolerance and the up-regulation of adenylate cyclase activity are dissociable phenomena (Bohn et al., 1999, 2000; Celver et al., 2004). Moreover, our present finding that the endocytotic efficacies of opioids are negatively correlated with the development of receptor desensitization argues against a fast receptor uncoupling after endocytosis. Here we provide evidence that agonists with low endocytotic efficacies such as buprenorphine, pethidine, or morphine showed faster receptor desensitization than receptor-internalizing agonists. In our experiments, receptor desensitization was defined as the decrease in receptor signaling, measured by inhibition of adenylate cyclase after long-term agonist treatment, and therefore represents both signaling lost by receptor uncoupling and signaling lost by internalization before recycling of the reactivated receptor. Both are separable events and affect the receptor signaling to transduction systems. However, the fast receptor desensitization of μ-agonists with low endocytotic efficacies reveals that receptor desensitization is mediated primarily by receptor phosphorylation and uncoupling and does not require receptor internalization. In fact, the reduced desensitization of agonists with high endocytotic potencies indicates that receptor internalization represents an important mechanism for the recycling and reactivation rather than the deactivation of the μ-opioid receptor signaling. This is further supported by our finding that blocking of receptor recycling by monensin led to acceleration of receptor desensitization after treatment with receptor-internalizing agonists. However, there is still confusion about the ability of morphine to induce receptor desensitization, because some studies have shown receptor desensitization by morphine (Koch et al., 2001, 2004; Borgland et al., 2003), whereas other reports claim that morphine is incapable of producing μ-opioid receptor desensitization (Whistler and von Zastrow, 1999; Alvarez et al., 2002; Bailey et al., 2003). This discrepancy could stem from differences in the methods of desensitization measurement and the different cell systems used in these assays. In most of the studies where no receptor desensitization after morphine treatment was observed, desensitization was determined by measuring changes in the K+ or Ca+ conductance or in cAMP-inhibition within minutes of exposure to the agonists. Because morphine-activated μ-opioid receptors are known to be poor substrates for G protein-coupled receptor kinase 2 phosphorylation (Whistler and von Zastrow, 1998; Koch et al., 2001), short-term incubations might not be sufficient for inducing morphine-mediated receptor phosphorylation and desensitization. This suggestion is supported by our recent finding that incubation with morphine results in a delayed but persistent μ-opioid receptor phosphorylation and desensitization (Schulz et al., 2004). Thus, it is reasonable to speculate that the observed morphine-induced receptor desensitization after long-term incubation (≥1 h) might be caused by an accumulation of phosphorylated and desensitized μ-opioid receptors in the plasma membrane. Long-term opioid treatment of μ-opioid receptor-expressing cells in culture produces a compensatory up-regulation of the cAMP pathway (Avidor-Reiss et al., 1995). To rule out that the decreased receptor activity observed after long-term morphine treatment is simply caused by an adaptive up-regulation of the adenylate cyclase activity, we tested the effect of long-term morphine and DAMGO treatment on the cAMP accumulation in HEK 293 cells after agonist withdrawal. In HEK 293 cells after 1 h of DAMGO or morphine treatment, no significant increase in the cAMP up-regulation could be detected (Fig. 5A), indicating that compensatory cAMP up-regulation is not involved in the observed decrease of receptor activity. However, after 8 h of agonist treatment, marked cAMP accumulation was observed for both DAMGO and morphine after withdrawal. Remarkably, treatment of HEK 293 cells with the receptor-internalizing agonist DAMGO for 8 h resulted in a significantly higher cAMP accumulation compared with the noninternalizing agonist morphine. In addition, blocking of receptor recycling in DAMGO-pretreated cells by monensin led to a decrease of the cAMP accumulation. 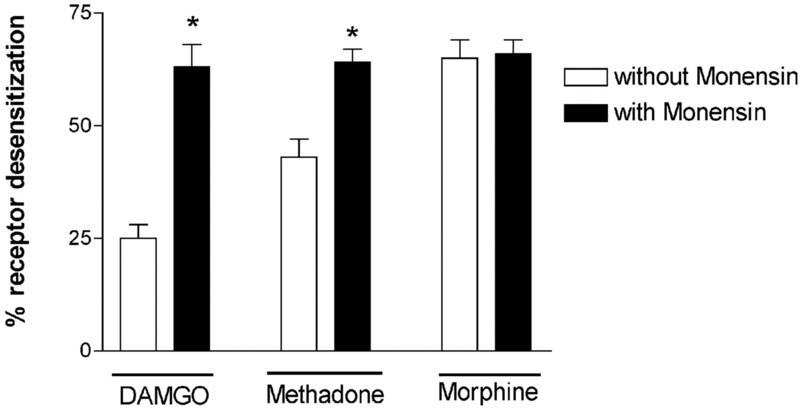 Furthermore, the μ-opioid receptor splice variant MOR1D, which undergoes endocytosis after morphine treatment (Koch et al., 2001), showed a higher cAMP accumulation after morphine treatment than the noninternalizing MOR1 wild-type receptor. These results indicate that the decrease in the receptor activity after morphine treatment is caused by receptor desensitization and not by compensatory up-regulation of the adenylate cyclase activity, as suggested by the RAVE model (Finn and Whistler, 2001). In addition, these data clearly show that prolonged receptor signaling mediated by receptor endocytosis and recycling/reactivation might reduce the development of tolerance but can enhance compensatory mechanisms that lead to opioid dependence. In conclusion, we have used HEK 293 cells expressing the rat μ-opioid receptor to gain information about the role of receptor internalization in the development of opioid tolerance and dependence. We have demonstrated that the efficacy of opioids to induce receptor endocytosis is negatively correlated with the development of receptor desensitization. On the other hand, receptor endocytosis was demonstrated to enhance the counter-regulatory up-regulation of adenylate cyclase activity after long-term opioid treatment by maintaining the receptor signaling. We thank Evelyn Kahl, Sandra Großeheilmann, and Dirk Franke for excellent technical assistance. This work was supported by Grants HO 1027/10-1 (T.K. ), SCHU 924/4-3 (S.S.), and SFB 426/A2 (V.H.) from the Deutsche Forschungsgemeinschaft; QRTL-1999-00908 (S.S.) from the European Commission; and the Dr. Robert Pfleger Foundation (T.K.). ABBREVIATIONS: MOR, μ-opioid-receptor; DAMGO, [d-Ala2,N-Me-Phe4,Gly5-ol]-enkephalin; HA, hemagglutinin; HEK, human embryonic kidney; ABTS, 2,2′-azino-di-[3-ethylbenzthiazoline sulfonate (6)]; ANOVA, analysis of variance; ELISA, enzyme-linked immunoabsorbent assay; AC, adenylate cyclase; RAVE, relative activity versus endocytosis. Avidor-Reiss T, Bayewitch M, Levy R, Matus-Leibovitch N, Nevo I, and Vogel Z (1995) Adenylyl cyclase supersensitization in μ-opioid receptor-transfected chinese hamster ovary cells following chronic opioid treatment. J Biol Chem 270: 29732-29738. Alvarez AA, Arttmangkul S, Dang V, Salem A, Whistler JL, von Zastrow M, Grandy DK, and Williams JT (2002) μ-Opioid receptors: ligand-dependent activation of potassium conductance, desensitization and internalization. J Neurosci 22: 5769-5776. Bailey CP, Couch D, Johnson E, Griffith K, Kelly E, and Henderson G (2003) μ-Opioid receptor desensitization in mature rat neurons: lack of interaction between DAMGO and morphine. J Neurosci 23: 10515-10520. Bohn LM, Gainetdinov RR, Lin FT, Lefkowitz RJ, and Caron MG (2000) Mu-opioid receptor desensitization by beta-arrestin-2 determines morphine tolerance but not dependence. Nature (Lond) 408: 720-723. Bohn LM, Lefkowitz RJ, Gainetdinov RR, Peppel K, Caron MG, and Lin FT (1999) Enhanced morphine analgesia in mice lacking beta-arrestin 2. Science (Wash DC) 286: 2495-2498. Borgland SL, Connor M, Osborne PB, Furness JB, and Christie MJ (2003) Opioid agonists have different efficacy profiles for G protein activation, rapid desensitization and endocytosis of mu-opioid receptors. J Biol Chem 278: 18776-18784. Celver J, Xu M, Jin W, Lowe J, and Chavkin C (2004) Distinct domains of the μ-opioid receptor control uncoupling and internalization. Mol Pharmacol 65: 528-537. Chen CA and Okayama H (1988) Calcium phosphate-mediated gene transfer: a highly efficient transfection system for stably transforming cells with plasmid DNA. Biotechniques 6: 632-638. El Kouhen R, Kouhen OM, Law PY, and Loh HH (1999) The absence of a direct correlation between the loss of [d-Ala2,N-Me-Phe4,Gly5-ol]-enkephalin inhibition of adenylyl cyclase activity and agonist-induced mu-opioid receptor phosphorylation. J Biol Chem 274: 9207-9215. Ferguson SS (2001) Evolving concepts in G protein-coupled receptor endocytosis: the role in receptor desensitization and signaling. Pharmacol Rev 53: 1-24. Ferguson SS, Downey WE 3rd, Colapietro AM, Barak LS, Menard L, and Caron MG (1996) Role of beta-arrestin in mediating agonist-promoted G protein-coupled receptor internalization. Science (Wash DC) 271: 363-366. Ferguson SS, Zhang J, Barak LS, and Caron MG (1998) Molecular mechanisms of G protein-coupled receptor desensitization and resensitization. Life Sci 62: 1561-1565. Finn AK and Whistler JL (2001) Endocytosis of the mu opioid receptor reduces tolerance and a cellular hallmark of opiate withdrawal. Neuron 32: 761-763. Goodman OB Jr, Krupnick JG, Santini F, Gurevich VV, Penn RB, Gagnon AW, Keen JH, and Benovic JL (1996) Beta-arrestin acts as a clathrin adaptor in endocytosis of the beta2-adrenergic receptor. Nature (Lond) 383: 447-450. He L, Fong J, von Zastrow M, and Whistler JL (2002) Regulation of opioid receptor trafficking and morphine tolerance by receptor oligomerization. Cell 108: 271-282. Keith DE, Anton B, Murray SR, Zaki PA, Chu PC, Lissin DV, Monteillet-Agius G, Stewart PL, Evans CJ, and Zastrow M (1998) μ-Opioid receptor internalization: opiate drugs have differential effects on a conserved endocytotic mechanism in vitro and in the mammalian brain. Mol Pharmacol 53: 377-384. Koch T, Brandenburg LO, Liang Y, Schulz S, Beyer A, Schröder H, and Höllt V (2004) Phospholipase D2 modulates agonist-induced μ-opioid receptor desensitization and resensitization. J Neurochem 88: 680-688. Koch T, Kroslak T, Averbeck M, Mayer P, Schröder H, Raulf E, and Höllt V (2000) Allelic variation S268P of the human μ-opioid receptor affects both desensitization and G protein coupling. Mol Pharmacol 58: 328-334. Koch T, Kroslak T, Mayer P, Raulf E, and Höllt V (1997) Site mutation in the rat μ-opioid receptor demonstrates the involvement of calcium/calmodulin-dependent protein kinase II in agonist-mediated desensitization. J Neurochem 69: 1767-1770. Koch T, Schulz S, Pfeiffer M, Klutzny M, Schröder H, Kahl E, and Höllt V (2001) C-terminal splice variants of the mouse μ-opioid receptor differ in morphine-induced internalization and receptor resensitization. J Biol Chem 276: 31408-31414. Koch T, Schulz S, Schröder H, Wolf R, Raulf E, and Höllt V (1998) Carboxyl-terminal splicing of the rat μ opioid receptor modulates agonist-mediated internalization and receptor resensitization. J Biol Chem 273: 13652-13657. Law PY, Erickson LJ, El-Kouhen R, Dicker L, Solberg J, Wang W, Miller E, Burd AL, and Loh HH (2000) Receptor density and recycling affect the rate of agonist-induced desensitization of μ-opioid receptor. Mol Pharmacol 58: 388-398. Pak Y, O'Dowd BF, and George SR (1997) Agonist-induced desensitization of the μ opioid receptor is determined by threonine 394 preceded by acidic amino acids in the COOH-terminal tail. J Biol Chem 272: 24961-24965. Pan YX, Xu J, Bolan E, Abbadie C, Chang A, Zuckerman A, Rossi G, and Pasternak GW (1999) Identification and characterization of three new alternatively spliced μ-opioid receptor isoforms. Mol Pharmacol 56: 396-403. Schulz S, Mayer D, Pfeiffer M, Stumm R, Koch T, and Höllt V (2004) Morphine induces terminal μ-opioid receptor desensitization by sustained phosphorylation of serine-375. EMBO J (Eur Mol Biol Org) 23: 3282-3289.
von Zastrow M, Svingos A, Haberstock-Debic H, and Evans C (2003) Regulated endocytosis of opioid receptors: cellular mechanisms and proposed roles in physiological adaptation to opiate drugs. Curr Opin Neurobiol 13: 348-353. Whistler JL, Chuang HH, Chu P, Jan LY, and von Zastrow M (1999) Functional dissociation of mu opioid receptor signaling and endocytosis: implications for the biology of opiate tolerance and addiction. Neuron 23: 737-746. Whistler JL and von Zastrow M (1998) Morphine-activated opioid receptors elude desensitization by beta-arrestin. Proc Natl Acad Sci USA 95: 9914-9919. Whistler JL and von Zastrow M (1999) Dissociation of functional roles of dynamin in receptor-mediated endocytosis and mitogenic signal transduction. J Biol Chem 274: 24575-24578. Williams JT, Christie MJ, and Manzoni O (2001) Cellular and synaptic adaptations mediating opioid dependence. Physiol Rev 81: 299-343. Wolf R, Koch T, Schulz S, Klutzny M, Schröder H, Raulf E, Bühling F, and Höllt V (1999) Replacement of threonine 394 by alanine facilitates internalization and resensitization of the rat μ opioid receptor. Mol Pharmacol 55: 263-268.